what they did with the grief. I have never met anyone like them. It was just over a year since the 9/11 attacks, and Andrew Rice was still grieving the loss of his brother in the South Tower of the World Trade Center. 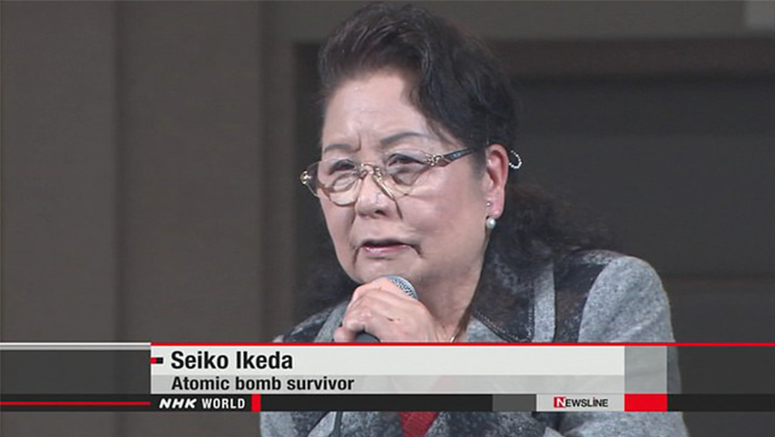 And it was almost half a century since the atomic bombing of Hiroshima, an attack that Seiko Ikeda had survived as a schoolgirl, less than a mile from the epicenter. And it had been three months since I had…graduated from an artsy college in Vermont. I had experienced nothing like their ordeals. I was a student coordinator at a nonprofit organization in D.C. But in the fall of 2002, I was allowed to travel with them—Mr. Rice and Mrs. Ikeda—for one week and hundreds of miles across the Northeast as they told their stories, night after night, in large auditoriums and around dinner tables. 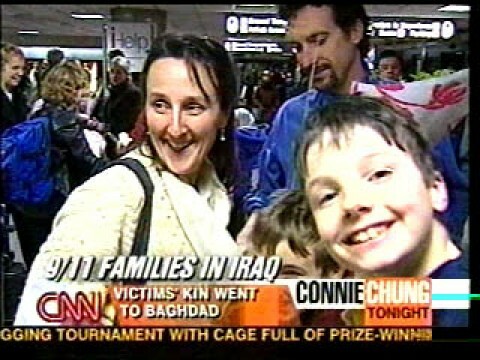 Peaceful Tomorrows families visited Iraq to urge U.S. officials to find alternatives to military action there. They were not just telling stories; they had a public plea to make. They didn’t want their loved ones’ deaths avenged. They wanted them honored… by sparing more innocent life. 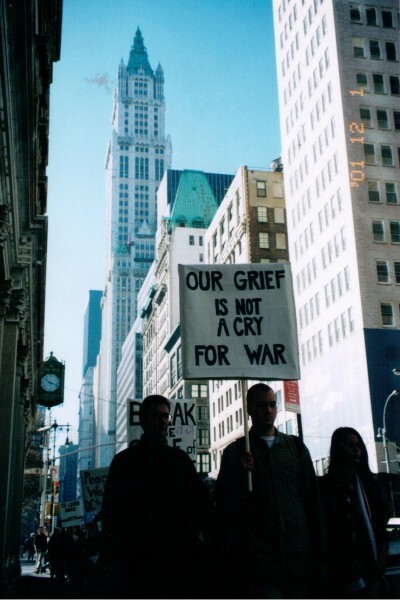 They were asking people not only to empathize with them, but to use that empathy to advocate for effective alternatives to war. 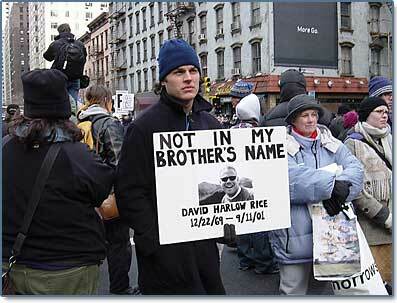 But today I’m thinking particularly about Andrew Rice, the man who lost his brother David on September 11. The death of his brother was still so close to the surface. I cannot imagine what it cost him emotionally to tell that story every night. But he was so kind, well-spoken, thoughtful. He was also so firm in his conviction that the U.S. should not respond to terrorism with a show of power and vengeance, but rather with international law and measures that avoided civilian casualties. Mr. Rice was part of an organization called September 11th Families for Peaceful Tomorrows, an extraordinary group of people who lost loved ones on 9/11. 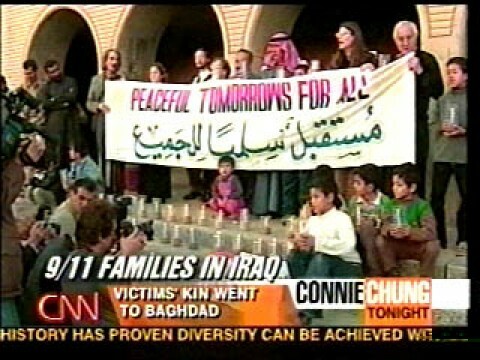 They were publicly urging politicians to honor their loved ones with a more rigorous commitment to peacemaking. They didn’t want other innocent people to suffer as they had. And they believed further civilian casualties would only fuel terrorist recruitment and put us in greater danger. Traveling with Mr. Rice and Mrs. Ikeda was one of the most powerful experiences of my life. Lots of speeches will be given today, the 16th anniversary of 9/11. Flags will be draped, and prayers will be said, and processions held, and politicians will tweet. Much of it comes from a pure place, a loving place. And some of it doesn’t. What I learned from Mr. Rice and other Peaceful Tomorrows families is that the loss of their loved ones is painful enough, but they are also particularly attuned to the ways their loss is co-opted for all kinds of political ends—war, torture, Islamophobia, fear of immigrants and refugees—ends that they find antithetical to human dignity. Year after year. And still, today. Sixteen years later. Sometimes the greatest gift you can give a suffering person is to listen to them. If you want to listen to the stories of Peaceful Tomorrows families, go here. sneak out with us . . .